On everyone’s list of things to see before they die are they Pyramids of Giza and the Sphinx. 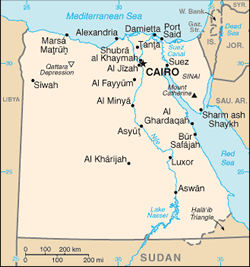 But Egypt is also the Nile, Luxor, Memphis, Alexandria and the beach side resort of Sharm El Sheikh on the Red Sea. 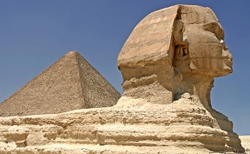 Join Sunny Land Tours on a trip to the land of the Pharaohs. Remember, you can use 60-Second Geography articles in your own newsletters and on your web sites. Egypt’s antiquities have drawn visitors since classical Greek and Roman times. Four thousand years of history have done nothing to dim the sense of amazement a traveler experiences encountering Egypt for the first, or fiftieth time. A bewildering mix of medieval and modern, Egypt’s gritty realities are the stuff that stirs the imagination and fuels the desire for travel. The monuments of the Nile Valley, hubbed by Cairo, remain the centerpiece for most stays in Egypt. But any itinerary should also include Alexandria, a trek into the desert and a drive along the Red Sea. Although travelers have been visiting Egypt for centuries, in modern times it was the Thomas Cook company who initiated steamboat services on the Nile and the idea of luxury cruises on the mighty river. The arid climate of the Nile Valley has ensured the preservation of its artifacts for over 4,000 years. Man, however, has been less kind, looting and destroying many of the ancient wonders: the damage to the Sphinx was wrought not by erosion and sand, but primarily by British and French soldiers using it for target practice during colonial times. Cairo’s most popular tourist sights are well known. The pyramids and the Sphinx are in Giza and sit just at the edge of town, startling many first time visitors who expect to see them in the middle of the desert. The Egyptian Museum will command a portion of any stay in Cairo. The contents of many of the pyramids are found here, including the contents of Tutankhamen‘s (King Tut’s) tomb. The Coptic Quarter in Old Cairo bears witness to an ancient form of Christianity that proceeded Islam by 400 years. Here legend says Mary and Joseph lived during the infancy of Jesus. The Coptic Orthodox Church remains highly active. Two hours north by train from Cairo is Alexandria, the second-largest city in Egypt. The seaside retreat was once the home to old Alexandria’s library, the greatest repository of books in the ancient world. The Khan el-Khalili market is one of the most famous shopping areas of Cairo. Bargaining is expected, and shoppers do well to be choosy. While jewelry and papyrus are popular souvenirs, the selection, and quality, varies widely from shop to shop. Includes 7 nights hotel in Hurghada or Sharm El Sheikh, half-board in Sharm, All-Inclusive basis in Hurghada, with transfers. Yes only $199 per person for total of 7 nights. Includes international non-stop air from JFK on Egypt air, accommodation and visits in Cairo, sleeping cars from Cairo to Luxor, a 4-day cruise along the Nile, and a 3-day Red Sea vacation in Hurghada. Book and pay for by May 8 for an additional $150 saving. Includes international non-stop air from JFK on Egypt air, 4 nights’ deluxe accommodation and comprehensive visits in Cairo to the Pyramids, Sphinx, Egyptian Museum and more, day trip to Abu Simble, and a 4-day deluxe cruise along the Nile. Book and pay for by May 8 for an additional $150 saving. Travel Agents: You can use the content above on your own web site or newsletter, compliments of the supplier sponsor above who has paid for your use of the materials. All you need to do is to follow the directions in the TRO Licensing Agreement. Also, please take a moment to check out the travel supplier that makes your use of this material possible.To use – Follow the procedure outlined in the TRO Licensing Agreement. Then, right click on this page and choose “View Source”. Copy the HTML and paste the copied html into your own web pages or newsletter. You may remove advertising.